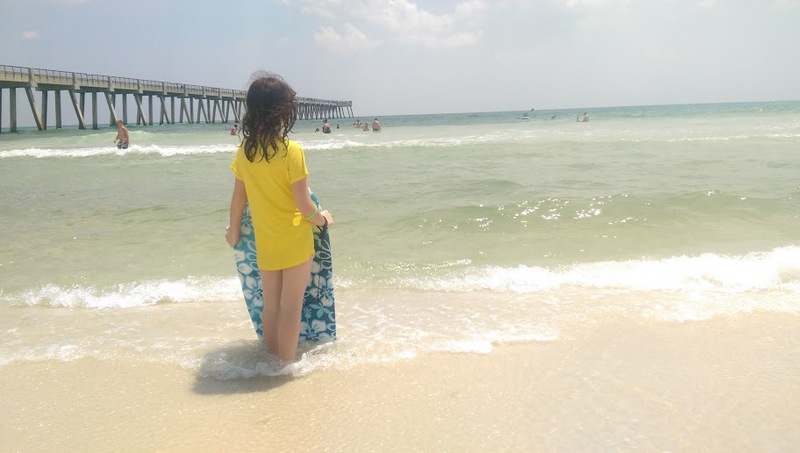 For a few days in August, my family and I discovered a new-to-us part of the Florida Panhandle through a travel opportunity provided by Trekaroo and the Santa Rosa County Tourism Development. With some of the best Gulf beaches in Florida less than an hour away, my family and I were game to explore a new Florida shore along the Gulf. My family and I traveled about seven hours north of Tampa to a portion of the panhandle known as the Emerald Coast. Upon our arrival, we understood the significance and soon, the name became as crystal clear as the deep green waters of Navarre Beach. 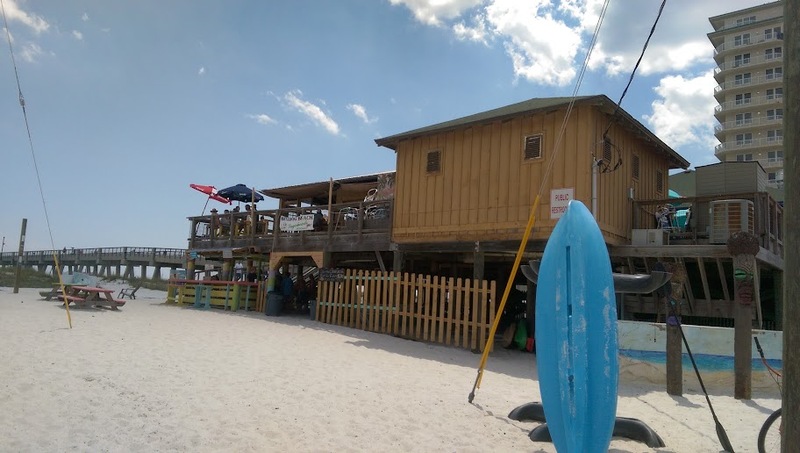 While #EmeraldCoasting and enjoying Florida’s Playground in the panhandle, I uncovered some of Florida’s Best Kept Secrets and very affordable fun on this gorgeous stretch of sugary sand. 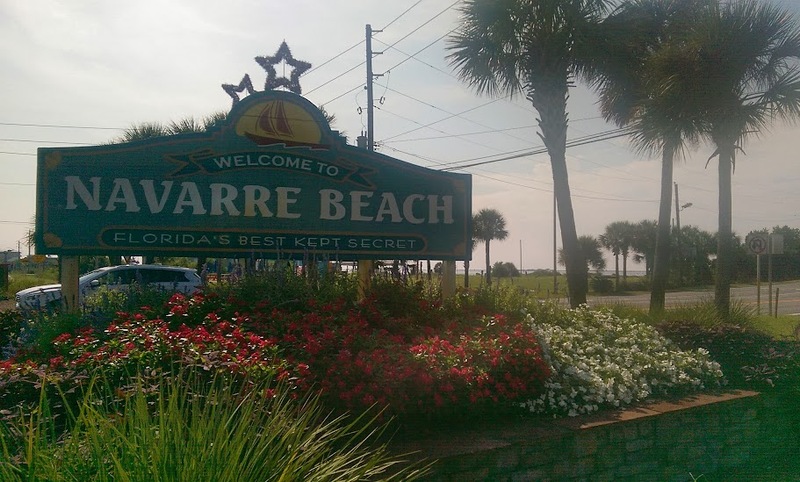 For military families, many Navarre Beach attractions offer military discounts which makes this Florida destination even more affordable. For tourists, the Navarre Beach Fishing Pier is to the Panhandle what the Southern Most Point of the U.S. is to Key West. You just have to walk “The Longest Pier in Florida” and capture a snapshot to prove you were part of something monumental for a very minimal fee of $1. My family and I enjoyed many fantastic views of Navarre Beach’s notorious fishing pier from the balcony of our beachfront condo at the Summerwind Resort*. Tucked beside the famous fishing pier sits Lagerheads on the Gulf. Lagerheads on the Gulf is truly Florida’s Best Kept Secret as there is no apparent signage to stake its claim on the beach. However, given the number of locals hanging out there on any given night, Lagerheads is definitely a popular hot spot and it was a winner with my family too. During the summer month, Lagerheads hosts free family-friendly summer movies on the beach every Wednesday evening. Families can enjoy some stargazing in the clear night sky and on the big screen. 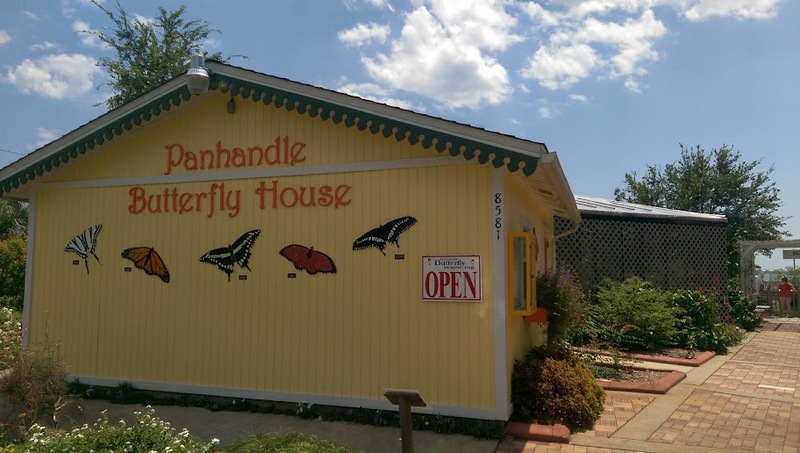 Tucked into the corner of the entrance of Navarre Beach Boulevard, sits the Panhandle Butterfly House - a modest little tourist spot home to several varieties of native and non-native butterflies. Navarre Beach visitors can escape the heat to admire some of the most beautiful butterflies in a natural setting. Admission is free but donations are greatly appreciated. Check website for updates and general public visiting hours. Climb aboard a pirate ship and set a course for another affordable Navarre Beach adventure! This seaside pirate ship play park sits adjacent to a splash pad and offers an amazing view of the intercoastal. Navarre Park is free and the perfect spot for young scallywags. Whenever I read the name of this food truck, I can’t help but quote Finding Nemo. “SHARK BITE HOO HA HA!” I found this tasty little gem via Yelp and the rave Yelp reviews did not disappoint. 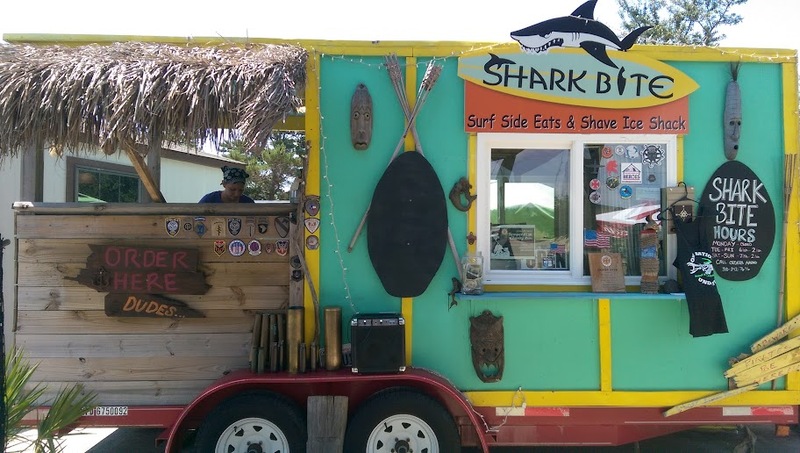 Shark Bite Food Truck offers a variety of Baja-style breakfast and lunch items and when it’s gone, they are gone for the day too. 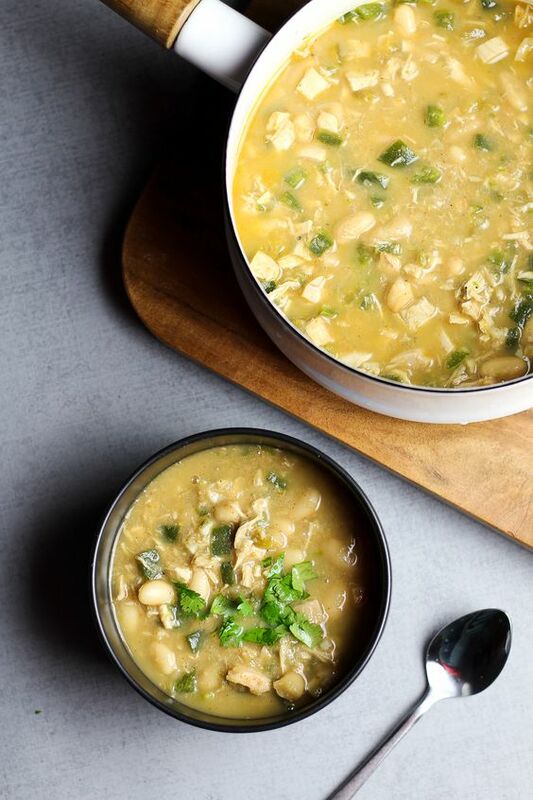 With a sandpit and adaptable menu items for picky eaters, Shark Bite is a dining option for families. 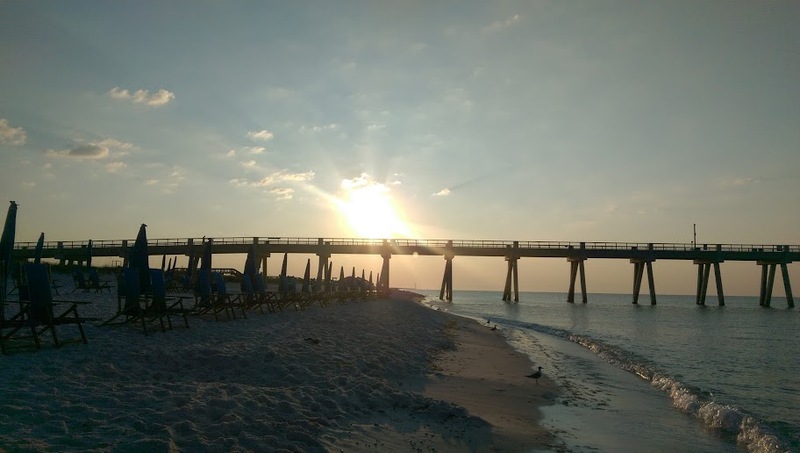 Juan Pagoda’s is the best spot on Navarre Beach to catch a nightly sunset. Bring a beach blanket and order a slice of Juan Pagoda’s famous Key Lime Pie. The pie paired with a gorgeous sunset will be a sweet ending to the perfect and very affordable Navarre Beach vacation. As part of our Trekaroo-Santa Rosa County experience, my children and I were given a one-day admission to the Gulf Breeze Zoo. This modest family owned and operated zoo is about a twenty minute car ride from the main tourist area of Navarre Beach. 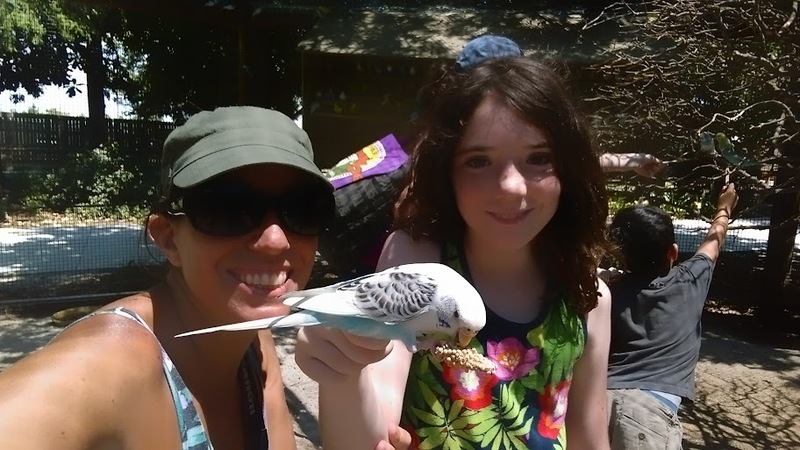 Each of my three children (13, 10, 5) loved a different aspect of the zoo, but they all loved feeding the Budgies (parakeets) which flocked to our feeding sticks like bees to honey. 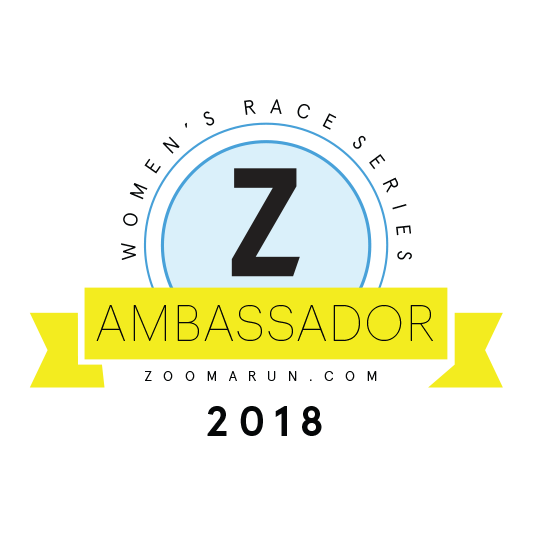 Between the cost of admission and the add-ons such as the train and the feeding experiences, the zoo can be a bit costly. 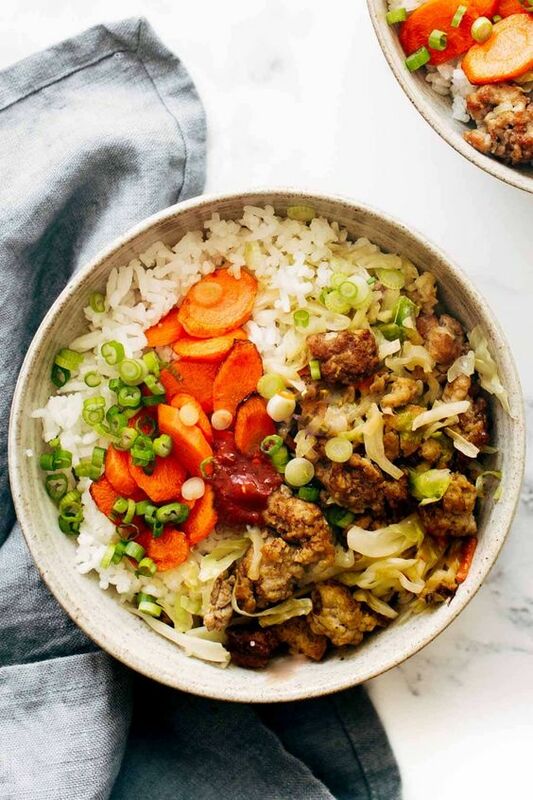 To save some pennies, pack a lunch and drinks as there are many spots to picnic inside the zoo. 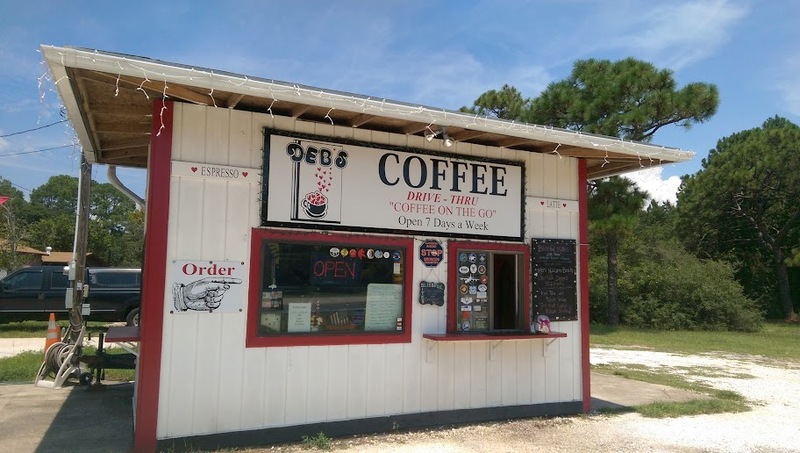 This little food truck disguised as a drive thru coffee shop is another one Florida’s Best Kept Secret which makes Navarre Beach such a charming spot. Deb works the window and serves a fantastic espresso with a smile. Skip the long lines at the overpriced popular “mermaid” and stop by to see Deb, Navarre Beach’s only brewing coffee mermaid on the beach. Sadly, this incredible facility was undergoing some renovations during our visit and we were unable to tour the center. Located at 8740 Gulf Boulevard in the Navarre Beach Marine Park, the Navarre Beach Sea Turtle Conservation Center offers guided tours and educational outreach activities to protect sea turtles and their coastal habitats. 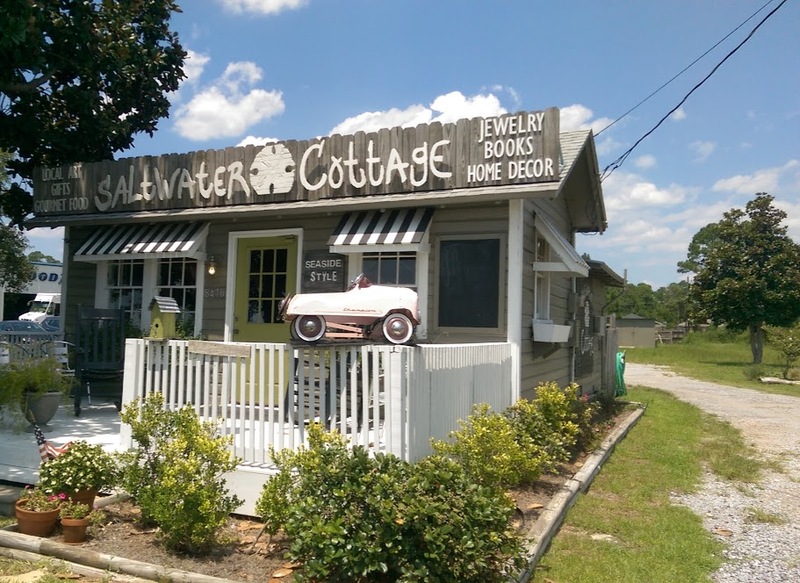 Saltwater Cottage offers some of the most unique beach theme-treasures. 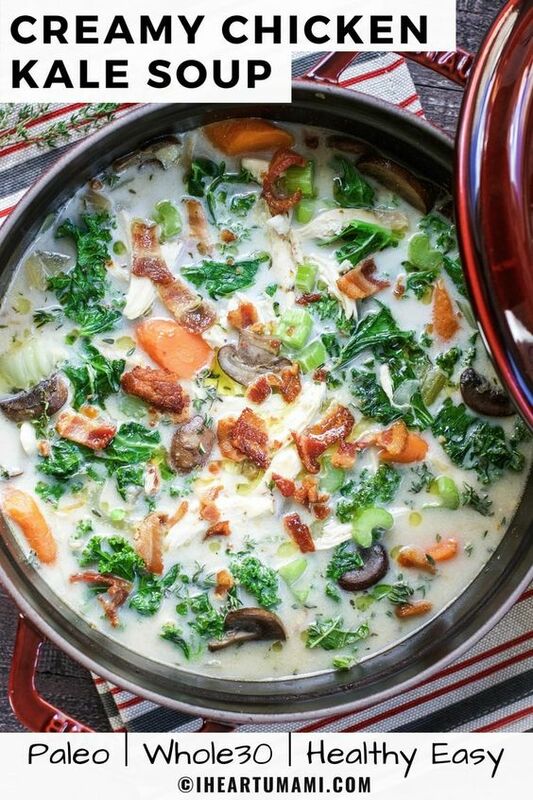 Toss the seashell trivet and bring home a true work of art hand-crafted by local artists. Saltwater Cottage also offers a wide variety of special seaside knick knacks and gifts. 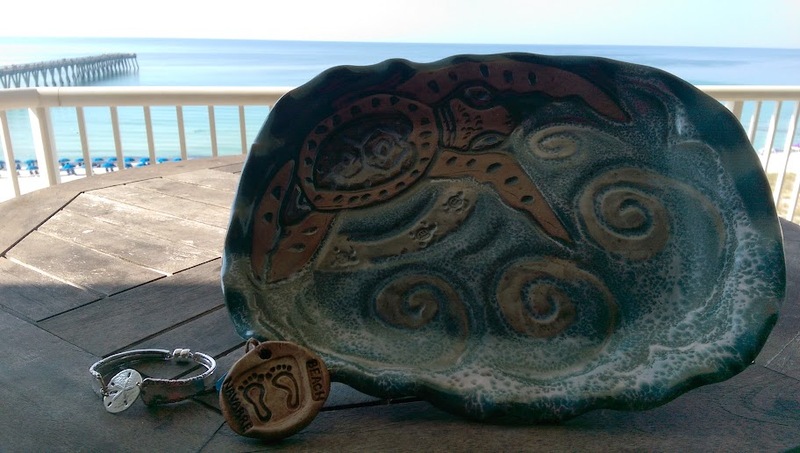 Just a few miles north of Navarre Beach in a town named Holley, visitors can discover some one-of-a-kind handmade pottery pieces that depict life on the Emerald Coast of Florida. Holley Hill Pottery creates superbly unique signed stoneware that reflects the natural beauty of local sea life. Navarre Beach is less than an hour from Pensacola, known as the Cradle of Naval Aviation. For that reason, beachgoers and military air craft enthusiasts can watch for distinguish soaring through the sky. During our stay, my family and I spotted multiple Black Hawk Helicopters and Lockheed AC-130 Gunships “Spooky” . 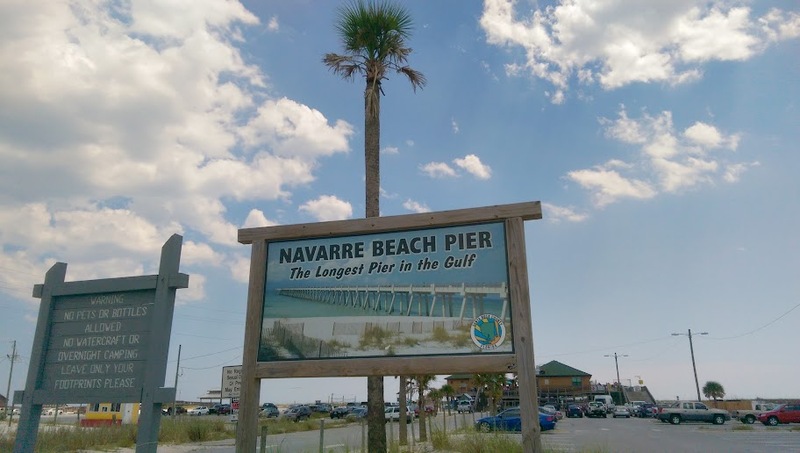 In the evening, Navarre Beach visitors can enjoy quite the firework show and the booming sounds of freedom as the gunships performing weapons testing and target practicing at Eglin Range. 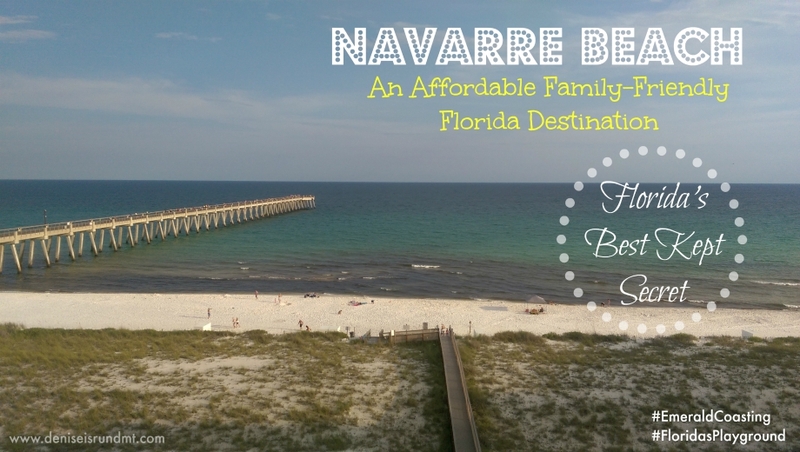 *As part of our Trekaroo visit to Navarre Beach, my family and I enjoyed a spacious condo at the Summerwind Resort. Our beautifully decorated beachfront condo graciously accommodated our family of five quite comfortably. 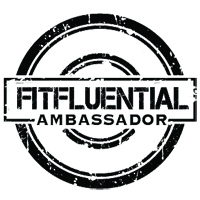 Each unit is independently owned. 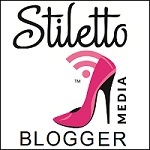 Check website for availability and rates. 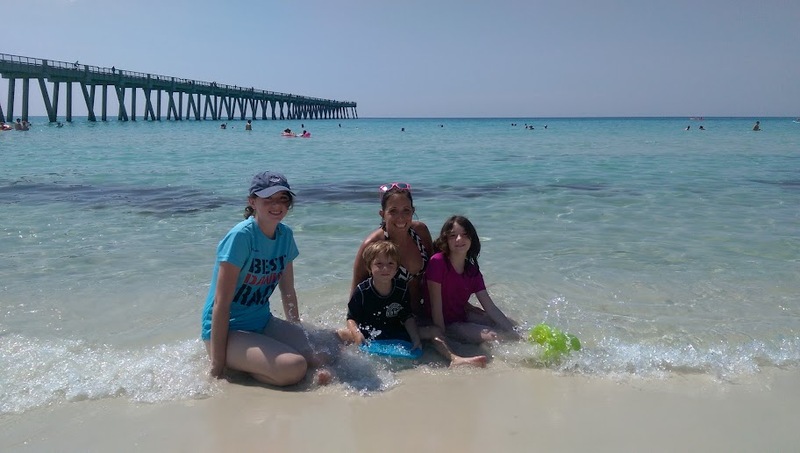 This entry was posted in family life, Life, review, travel and tagged beach, Emerald Coast, family, family-friendly, Florida, Gulf Beaches, kids, Panhandle, review, Run DMT, Santa Rosa, travel, Trekaroo.